Prior to being diagnosed with Relapsing Remitting Multiple Sclerosis at the age of 41, Jacqui had been a very physically active person; as well as regular long walks in the beautiful countryside surrounding her home in the New Forest, she was an accomplished Latin dancer and had a horse that she rode every day and the pair would enter dressage competitions. In the past, Jacqui and David had talked about the possibility of getting a pet but with Jacqui now in a wheelchair, they didn’t feel that they could. “Having both had dogs in the past, we really wanted another one. 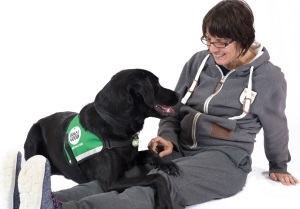 But then we started thinking and it struck us that perhaps we would be able to get an assistance dog,” says Jacqui. When Jacqui and David attended an information day at Dogs for Good, the trainers brought in a couple of assistance dogs in training to help guests understand what tasks the dogs can undertake. From the moment he arrived in their lives, as well as being able to carry out tasks such a s picking up dropped items, opening doors, bringing her the phone and remote controls etc. he helped to repair Jacqui’s confidence and ease her grief. “The world suddenly became brighter and I started to feel more like myself.” she says. She was finally able to get out and about and within a short space of time, had purchased an all-terrain wheelchair. Which she has named ‘Gloria’! According to David, there are no words to accurately describe the change Duke has brought about in Jacqui and as a result, in his life, too. 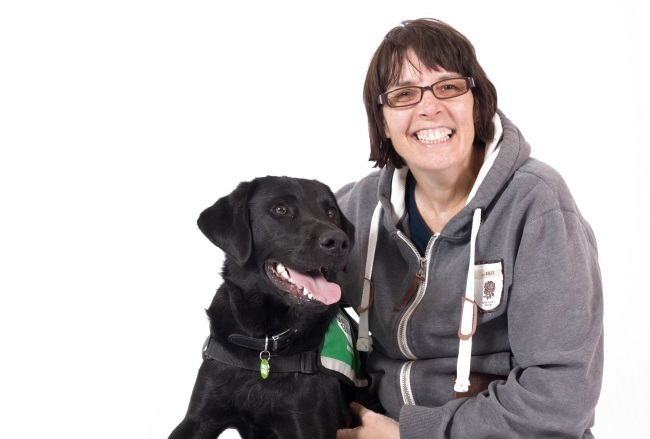 “On a practical level, I don’t worry about being away from the house any more because I know Duke will keep Jacqui safe as well as helping her with everyday tasks.